Unearth the secrets of geology! Unearth the secrets of geology as you dig deep into the science of rocks and minerals and the crystals that form them. Through 18 hands-on experiments, kids ages eight and up will discover some pretty amazing things about geology, mineralogy, and crystal growing. Become a geologist-in-training as you mold your own crystal geode and grow three different types of crystals that vary in color and shape. 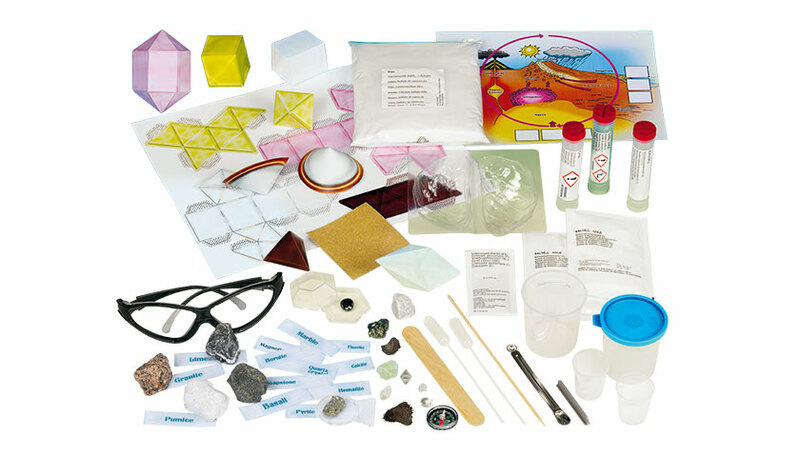 Work with real mineral specimens to learn how to determine a mineral’s chemical properties — such as color, luster, streak color, hardness, density, magnetic properties, and carbon, sulfur, or iron content — and use your findings to identify unknown minerals. As you explore, you’ll get an overview of the geologic rock cycle and discover how the three main categories of rock — igneous, sedimentary, and metamorphic — are formed, altered, destroyed, and formed again. Whether you’re a geology enthusiast already, or just discovering this rocking science for the first time, Kids First: Crystals, Rocks & Minerals makes for an unforgettable and fun educational experience.